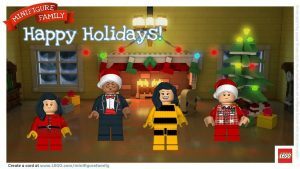 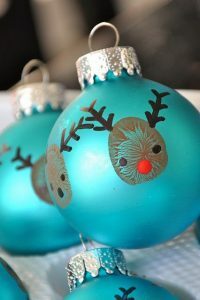 Are you in a Christmassy mood yet? 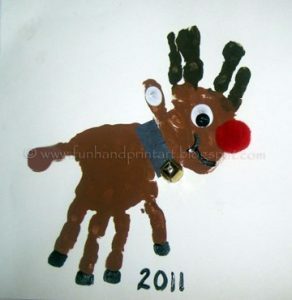 For some reason, I’m starting to feel it really early this year. 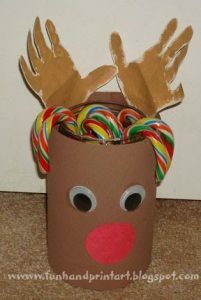 I usually refuse to do Christmas stuff before Thanksgiving. 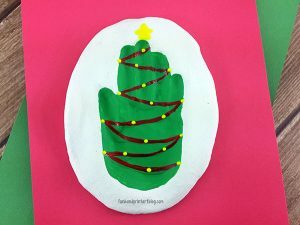 But I know that a lot of you like to get ready early, so I’d like to share my latest fingerprint resist greeting cards with you: fingerprint Christmas tree cards! 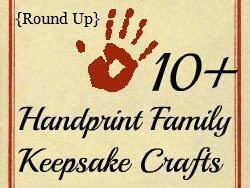 I’ve previously shown you fingerprint Easter egg cards and fingerprint cards for Mother’s Day using two different techniques, and for the Christmas version, I’m offering free printable templates for both techniques. 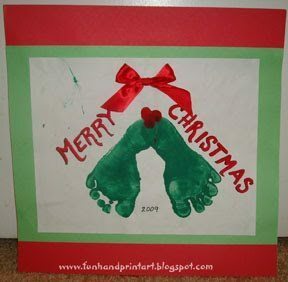 There are three different templates in the pdf file. You can print the first and second templates directly on your card and follow the outlines with fingerprints. 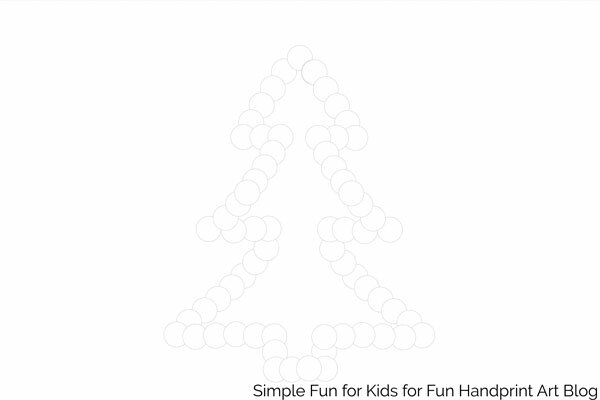 The first one fits the entire page. 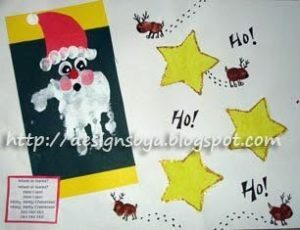 The second template features two cards. 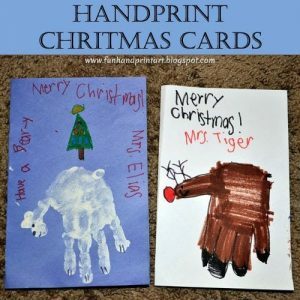 They’re intentionally gray instead of black to make it easy to cover them with paint so they aren’t visible when you’re done with your card. 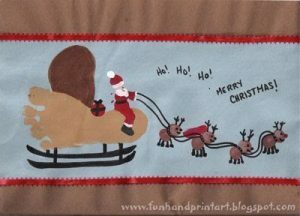 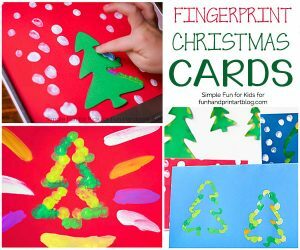 The third template features four Christmas tree outlines in different sizes that you can cut out and put on your card with sticky tape before following the outer edges with fingerprints. 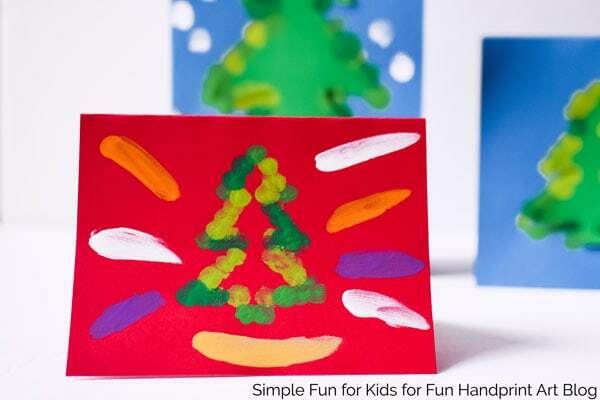 Once the paint has dried, you can choose to keep the template on the card or remove it. 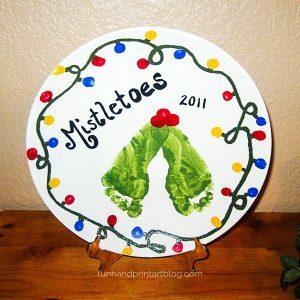 It looks great either way. 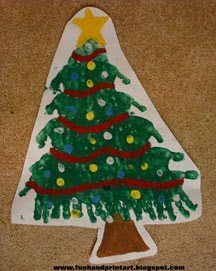 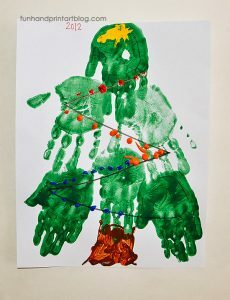 My 5-year-old used this template a bit differently and decided to make more of a fingerpainted Christmas tree. 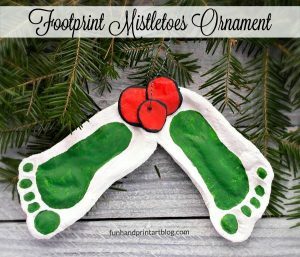 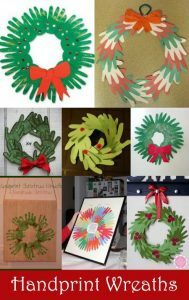 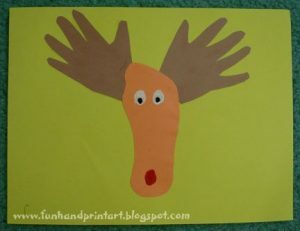 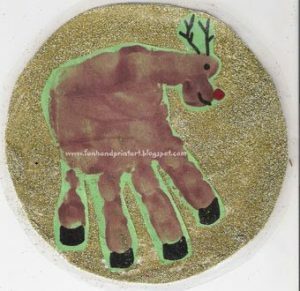 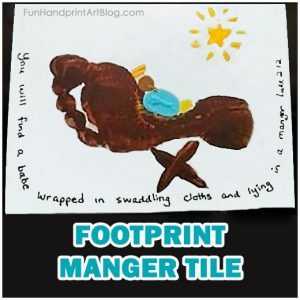 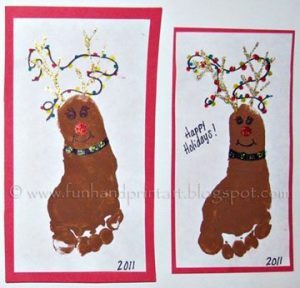 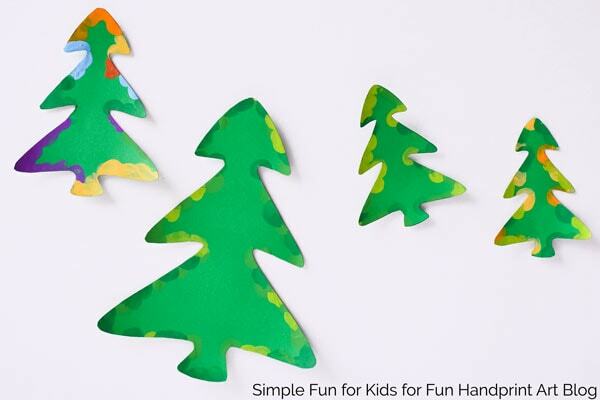 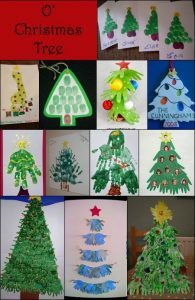 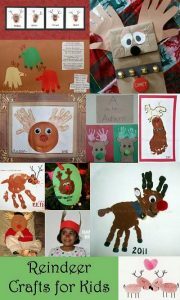 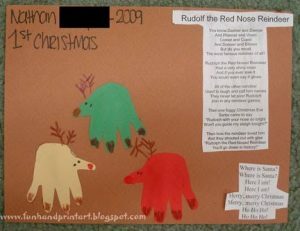 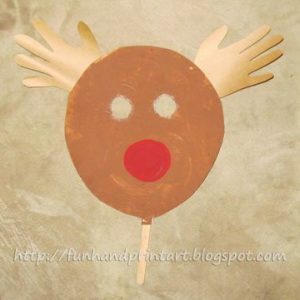 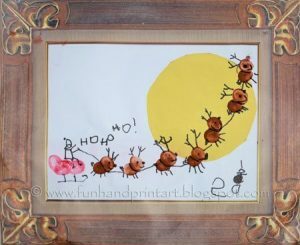 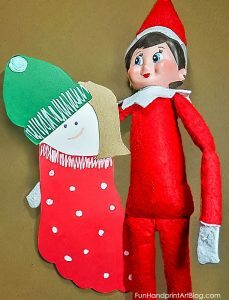 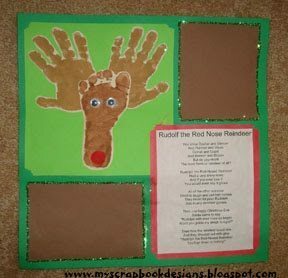 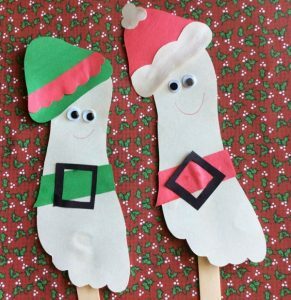 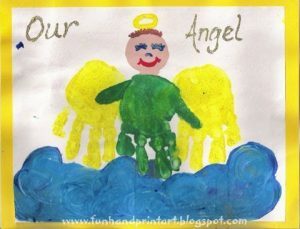 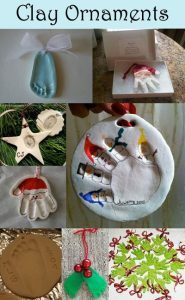 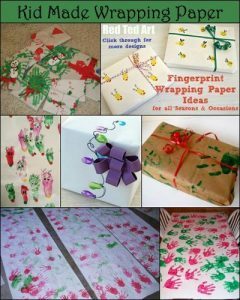 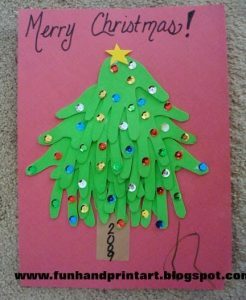 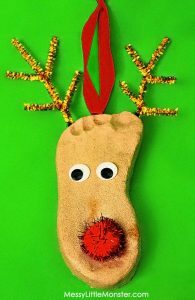 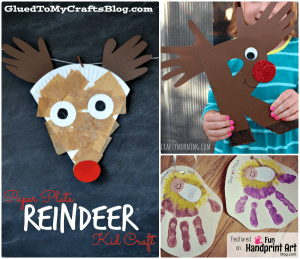 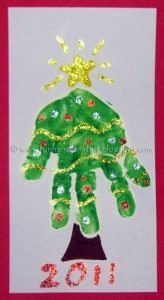 Are you looking for other ideas to make Christmas cards using little hands and feet? 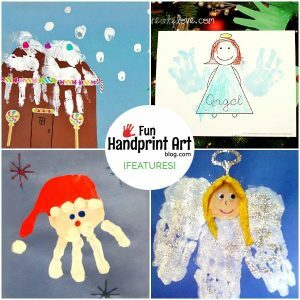 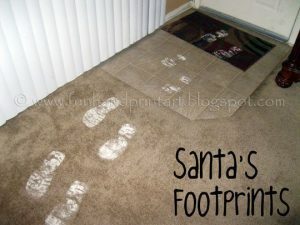 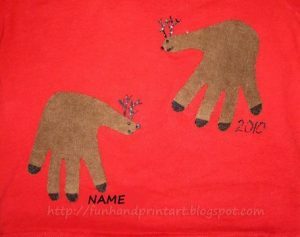 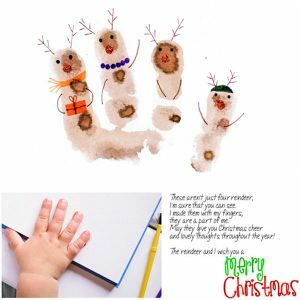 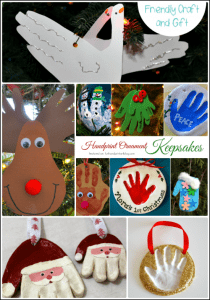 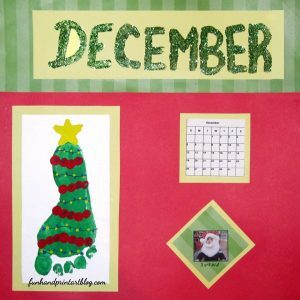 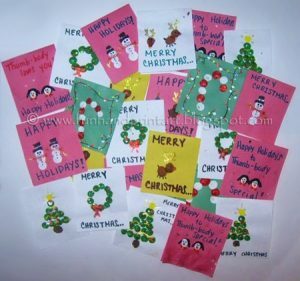 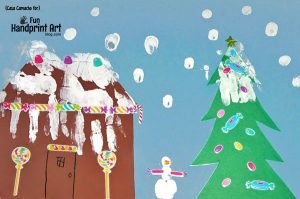 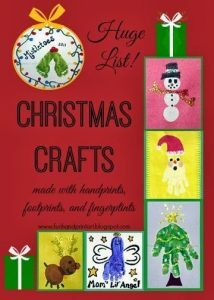 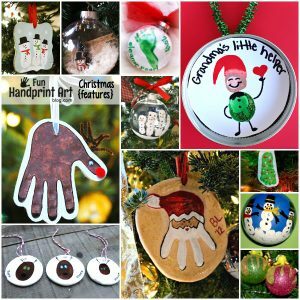 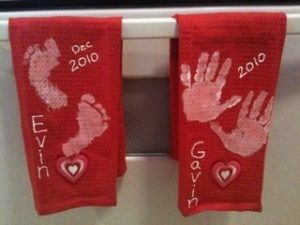 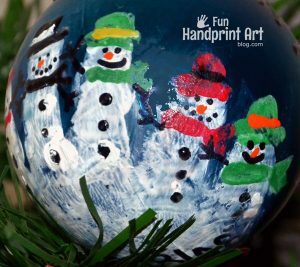 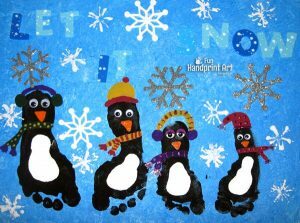 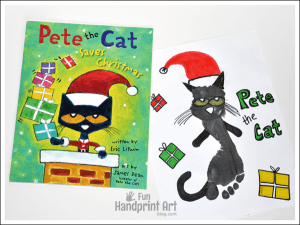 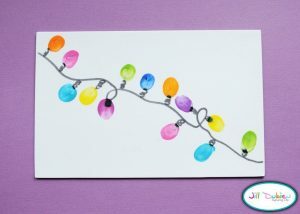 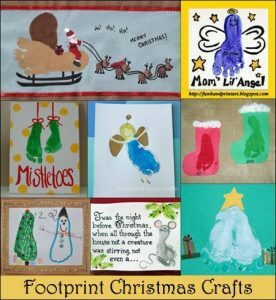 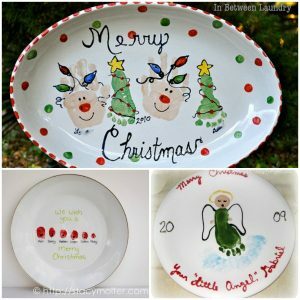 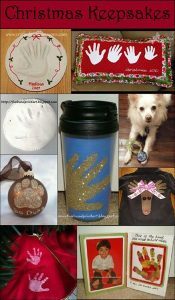 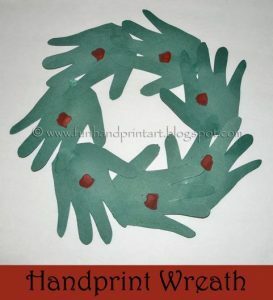 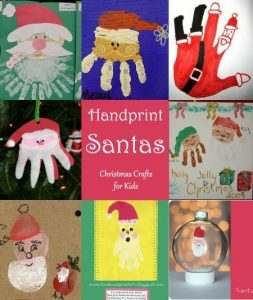 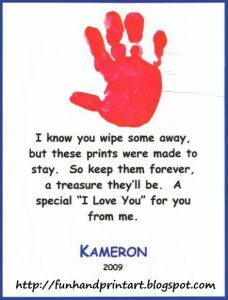 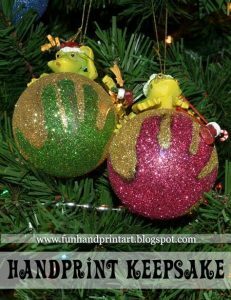 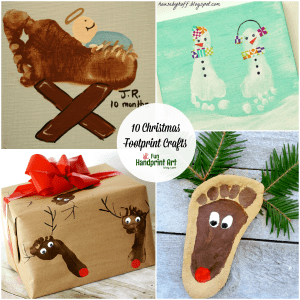 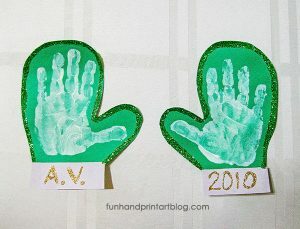 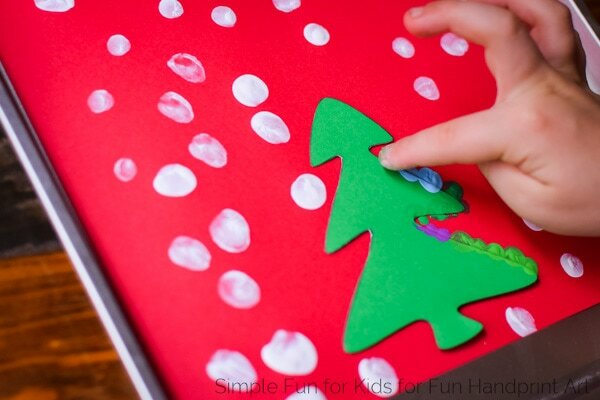 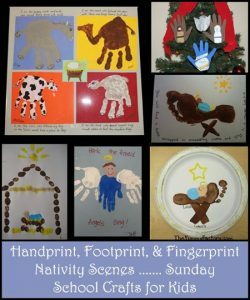 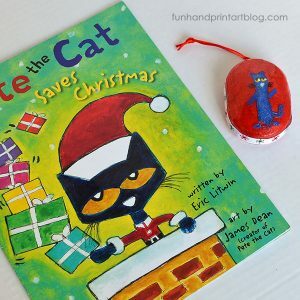 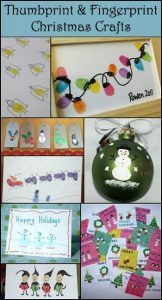 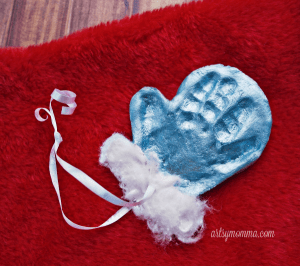 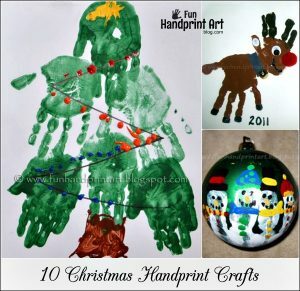 Check out these handprint Christmas cards and these thumbprint Christmas cards. 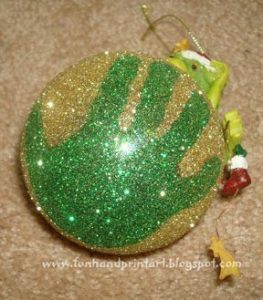 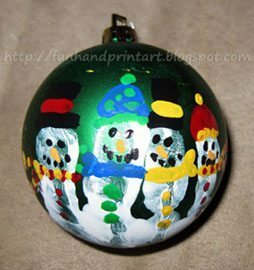 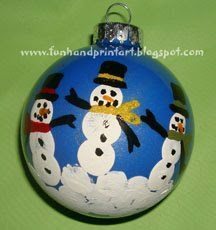 Far and away my favorite handprint ornament that we’ve made is this snowmen Christmas ornament. 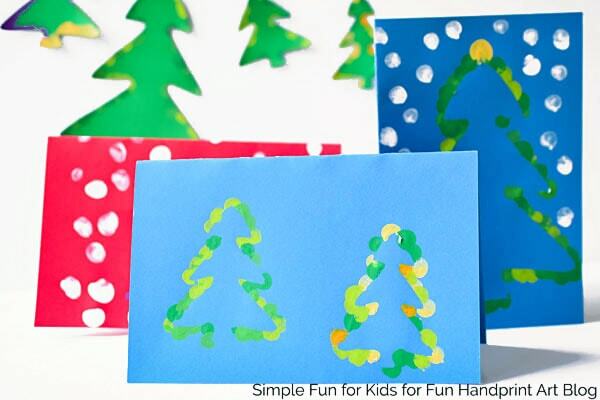 You can easily use the same technique on a card! 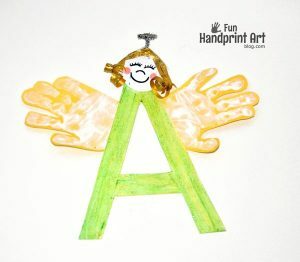 Hi, I’m Tina! 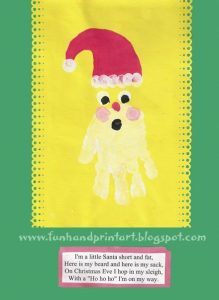 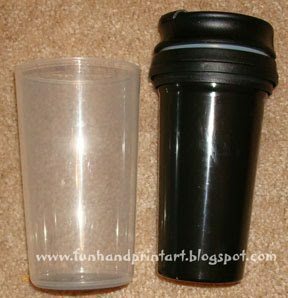 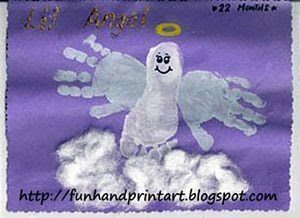 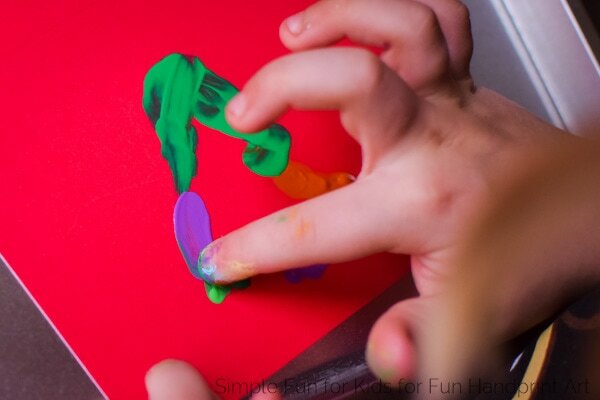 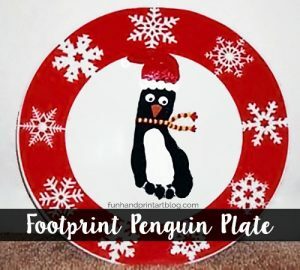 I have a toddler and a preschooler, and I blog at Simple Fun for Kids where I share printables and simple ideas for crafts, sensory, science, and art activities for kindergartners, preschoolers, toddlers, and babies. 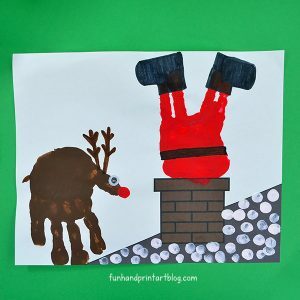 We're from Germany but currently live in Texas. 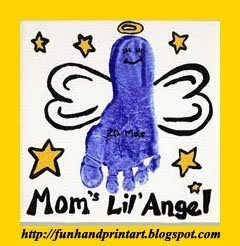 Come on over to get to know my kids, my blog, and me better! 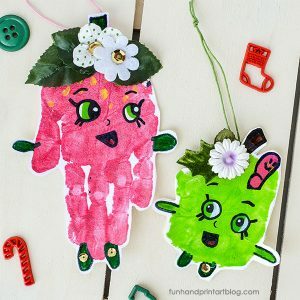 Hi, I’m Tina! 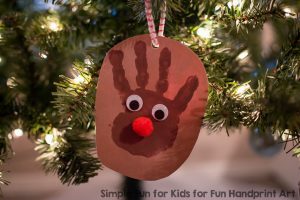 I have a toddler and a preschooler, and I blog at Simple Fun for Kids where I share printables and simple ideas for crafts, sensory, science, and art activities for kindergartners, preschoolers, toddlers, and babies. 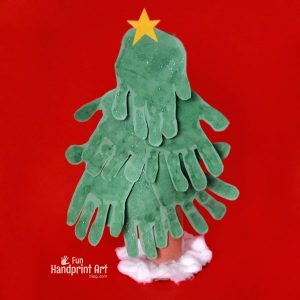 We're from Germany but currently live in Texas. 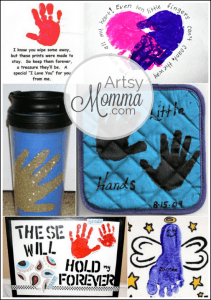 Come on over to get to know my kids, my blog, and me better!